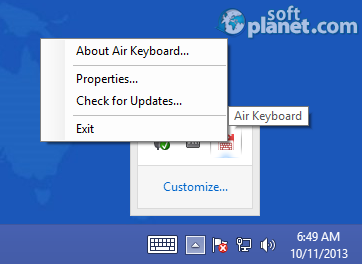 SoftPlanet makes it possible for everyone to get free Air Keyboard download directly from our servers. There is no registration needed for downloading. Air Keyboard 1.8.0.0 is a fun to use and at the same time very useful application which allows you to add a virtual keyboard to the screen of your portable device like iPhone, iPad or any Android compatible one. You will have to download and install the Windows or MAC OS version of the software to your desktop computer and then to your mobile device. Because Air Keyboard has versions for PC and MAC you have to check first if your operating system is supported. Also you have to make sure that you will not be charged for using your Wi-Fi or 3G connection, otherwise it is not worth a try. The connection between the two devices is password protected and you can change it to a different type of connection than the default one. Air Keyboard has some known issues and limitations but this fact is well-explained on the developer's website. One of them is that you will not be able to enter your password remotely before you log-in. This is because there is built-in Windows protection against simulation. Another limitation is that the program will only work if it has been started with a normal account, not as an administrator, again because of security issues. Only the US layout keyboard has full and compact modes. The developer nicely promises to include more layouts in the near future. 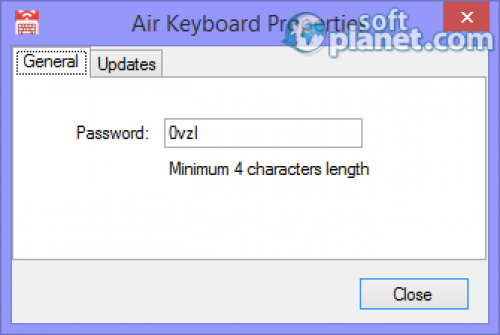 Air Keyboard is a fun to use application but at the same time it is not advisable to use it when you enter sensitive data such as log-ins, password, credit card information, etc. Also make sure that you use a strong enough password just in case. You can export any of the layouts which you create with your Air Keyboard 1.8.0.0 to your computer so you can change them in a text editor or share them with other people. Layout images can be imported and exported using an iTunes app. Our security scan shows that Air Keyboard is clean from viruses. The current version of Air Keyboard has been scanned by our system, which contains 46 different anti-virus algorithms. 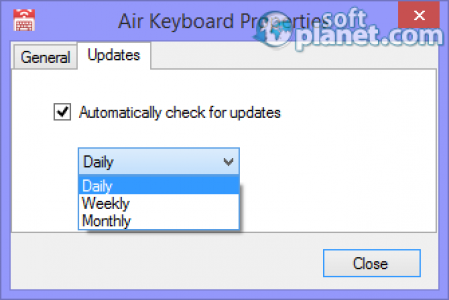 That ensures that Air Keyboard 1.8.0.0 is 100% safe for your computer.